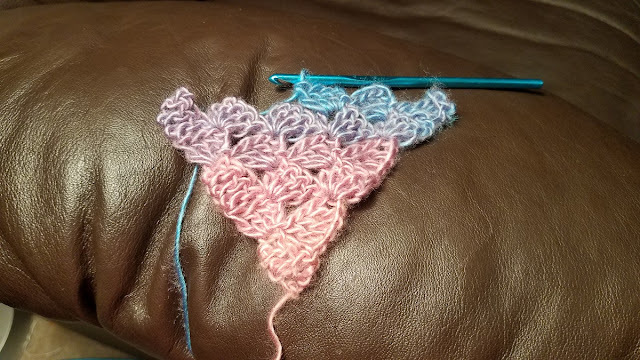 I took a small break from crochet. I was up to my eyeballs in yarn there for a while, plus, with our extra hot summer, hanging out with a bunch of thermal yarn in your lap was only going to make me extra warm, which is a big no bueno in my book. 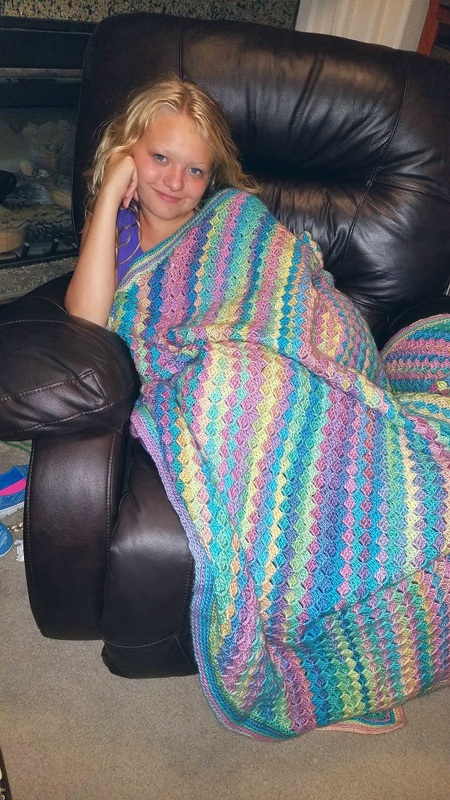 It took seeing a cute blanket on Pinterest to completely inspire me. 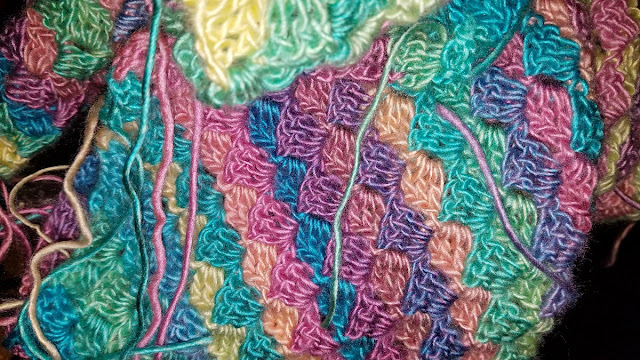 Not only was the pattern intriguing, but the colors were absolutely beautiful. 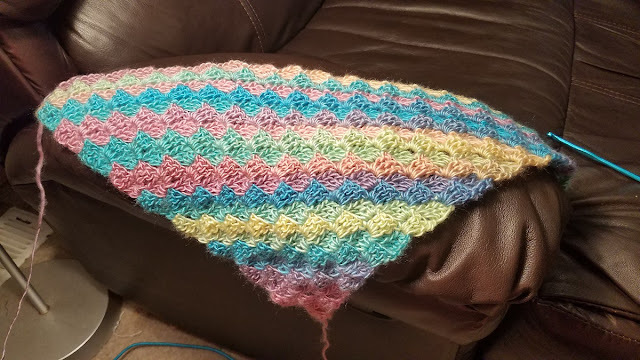 Behold, my first attempt at corner to corner crochet. 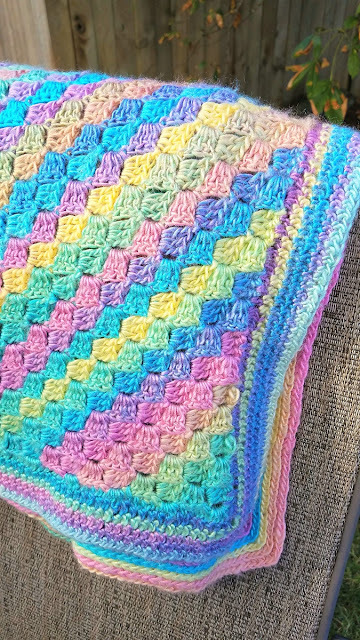 By the way, you can find the free pattern and tips for making this blanket by Susan Carlson on her blog "Felted Button" here... and the yarn is called "candied" by Red Heart Boutique Unforgettable Yarn, which is pretty much gorgeous, and can be purchased at craft stores like Joann's, and also in multipaks at Amazon. 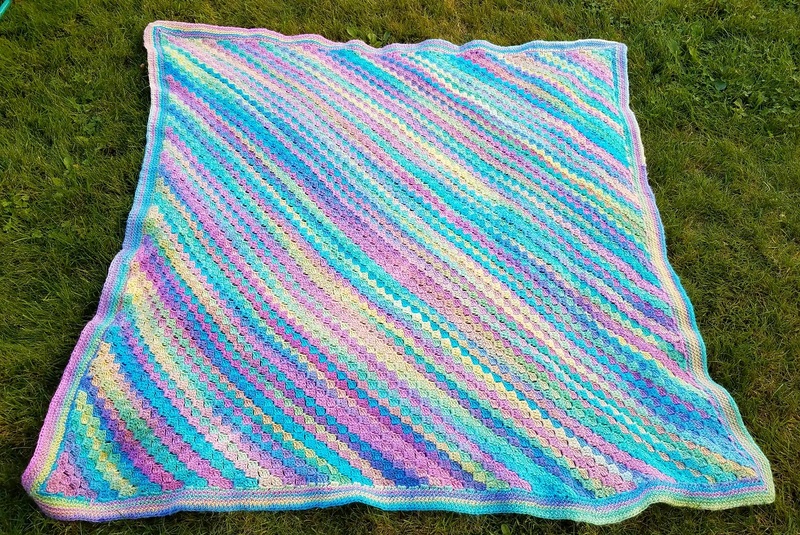 Because of the increasing (or decreasing at the end of each row), I would consider this blanket at the intermediate level. 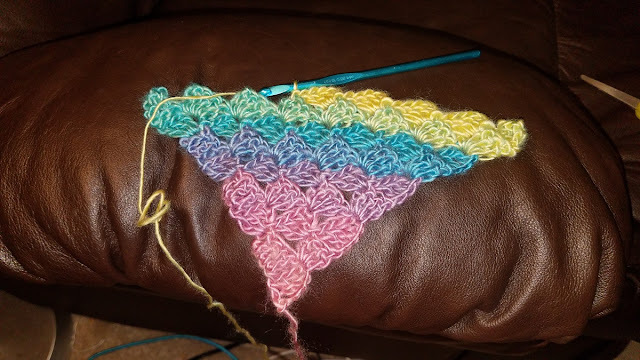 Just as a personal tip, I also watched a number of YouTube videos to make sure I had started the pattern of increasing correctly before getting too far into the project. 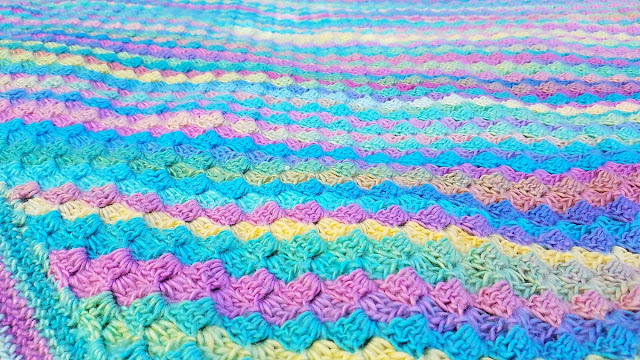 The thing about crocheting any blanket typically is... it's super boring. Seriously. You get the initial chain stitch down for as wide as the blanket needs to be, and then go back and forth, back and forth, same number of rows and columns, repeating the same crochet pattern over and over until a blanket starts to form. This is great if you are on a plane, or in a waiting room somewhere and don't want to count rows, but for me, after a day or two, the endless back and forth feels more like a drudgery to me than a fun crafty side project. Enter in corner to corner crochet! Corner to corner does just that, it starts in the corner. You need to add a row of increase at the end of every row, which is just enough to keep you interested and your mind sharp. Corner to corner, this got me really excited when I saw the rows change on their own. 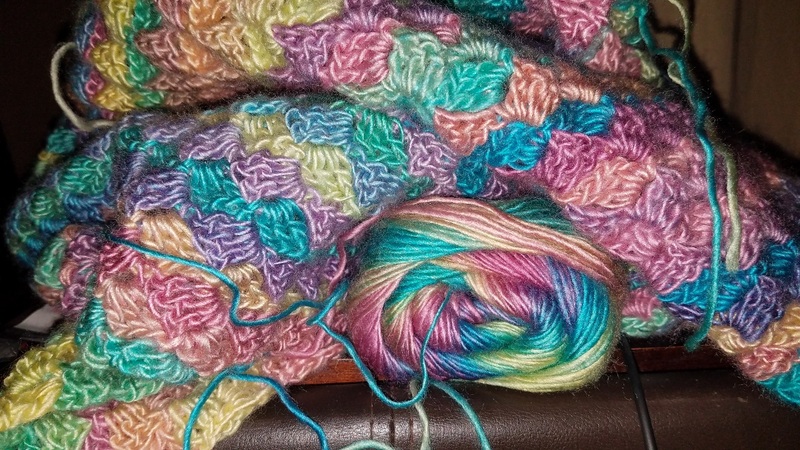 The other awesome thing about corner to corner, is that if you pick a yarn that has a slow color change, you won't need to switch colors all the time (and tie off loose ends, my least favorite part of a complicated blanket). The yarn magically and gradually changes into one beautiful color after the next. It's working, it's really working! until it gets wider and wider, and you need your tween daughter to hold it up for a picture. Thanks for helping me Vivi! I will admit I did get a bit persnickety in the middle of the blanket about not wanting two rows to be the same color. 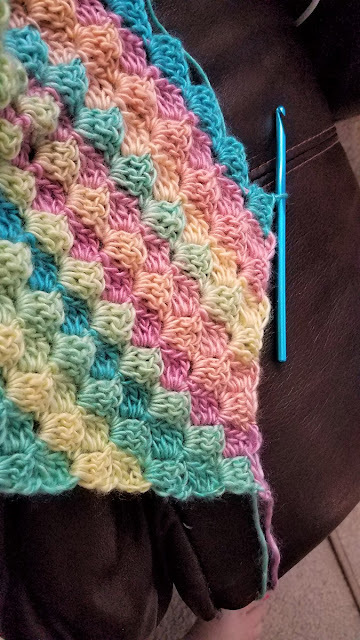 When I saw the pattern might make two rows of the exact same pink shade near the same part of the blanket, I would cut and tie off the yarn at one end, pull a few feet out of the working yarn, and start the new color so it wouldn't sync up later in the pattern. 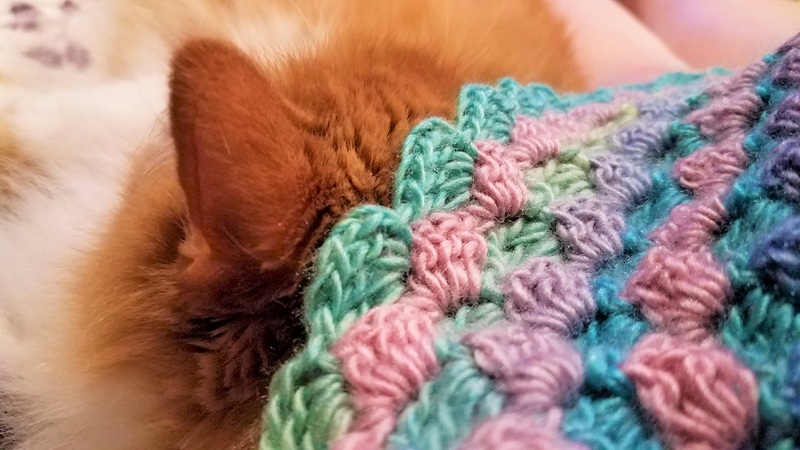 Oh and be it noted, no matter how warm it is outside, crochet will attract your kitties, they love to "help" by laying directly on your work. When you get as wide as you think you want to go, now is the time to switch it up, and start decreasing each row. This keeps you mentally on your toes and helps minimizing boredom. I also went to YouTube to make sure I was doing this correctly. Decreasing suddenly makes a square edge appear along the sides - neato! 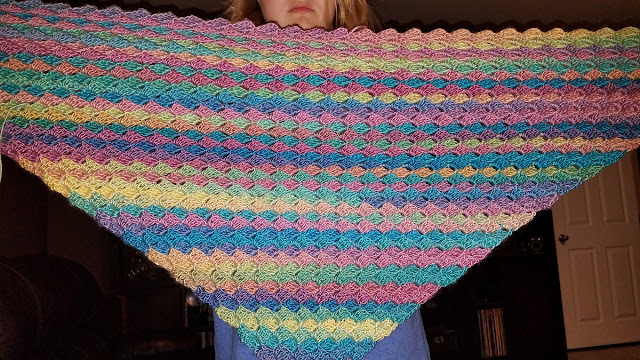 It's fun to see the rows shrink and shrink until all you have left to do is to put an edge on it, and tie off the loose ends (you'll still have some - just not as many as if you switched rows every color). Then you can sit back and admire your work. This was the first time I could lay it out on the floor and take a step back. 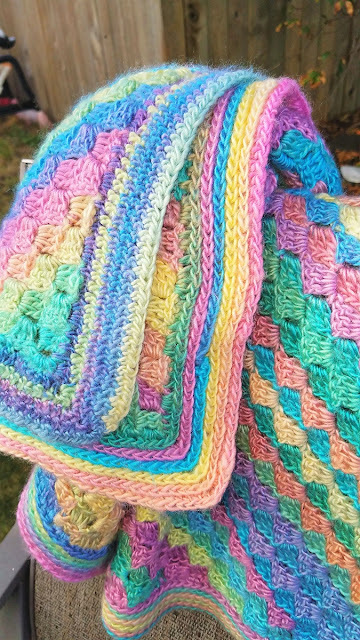 It was awesome how the color change of the yarn made the most excellent stripes, and almost gave it an optical illusion effect. Here is it draped over a chair. I just love how it turned out! The next day I took it outside to get some shots of the colors "in the wild". Unicorns would definitely approve of this blanket, so many colors! Candied yarn - love the color changes! From sea to shining sea it's color mania. 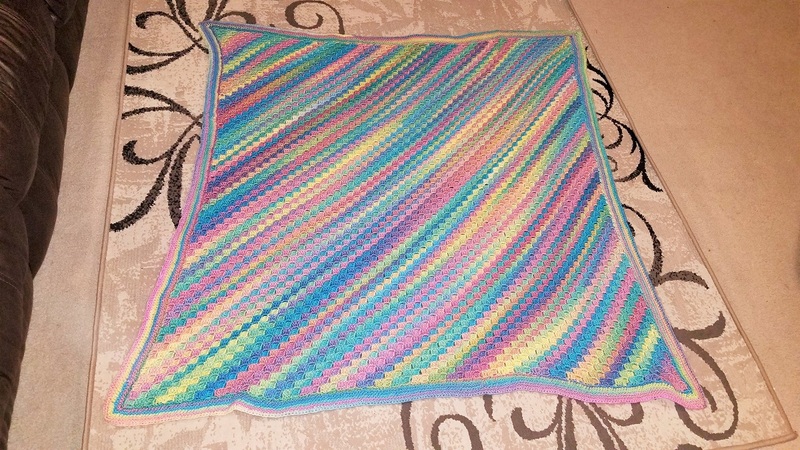 Oh and the border on this pattern gave it a nice solid edge, and actually made two different variations, depending on which side of the blanket you are looking at. Flat facing on the front of the blanket, loops on the back side border. This blanket is warm and soft, but not too heavy. It's perfect for family movie nights in our new chair. It was immediately claimed by my eldest, as you can see here... she's ready for a bowl of popcorn. Vivian says this blanket is "hers" now. This was a really fun, and really beautiful blanket to make. 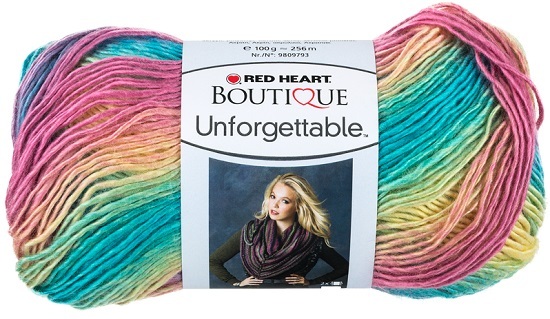 Red Heart Unforgettable yarn is not only super soft, but comes in a bunch of beautiful slow color change patterns. I was thinking about picking a new color scheme and making a second one actually. 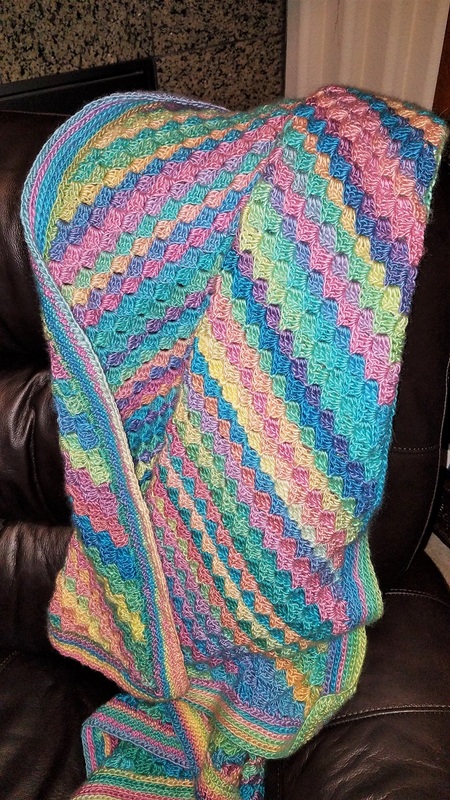 Feel free to post any projects you are working on, and... Winter is coming... so happy crochet everyone!